The latest release of DLS is now available for customers that have been experiencing Chrome security issues with the previous release! Just thought I’d let you know that it appears you haven’t signed the .PKG that’s inside the DMG correctly. When attempting to install I’m getting this screen. Same here, getting a “Can’t be opened because it’s from an unidentified developer” error on trying to open the PKG. We don’t want to advise our customers to circumvent core MacOS security features. Please fix! Gatekeeper can be re-enabled after completing the install. Either by changing the setting in System preferences back to App store and recognized 3rd party, or by using the terminal command sudo spctl –master-enable. Make sure your Security is set on Anywhere in System Preferences > Security and Privacy. If you need to disable GateKeeper (the Sceurity setting on 10.12), open Terminal, type sudo spctl –master-disable and hit enter. Enter your admin password, then you should be able to run the installer successfully. I look forward to an updated version of the Mac installer that is properly signed and avoids these pitfalls. I agree with Will, this puts us in a tough spot with customers when we have to advise them to circumvent standard security. To make it worse, the issue that this release resolves is a security related issue. I am sensing a significant loss of confidence in Dymo, and consequently my solution, from customers as a result of these issues. Please update to a signed version that does not put us as partners in an awkward middle-man position. The updated, signed installer works great! Thank you. Is there a fix for RetrieveInstalledPrinters (mentioned by some people here: http://developers.dymo.com/2017/03/08/the-new-dls-8-6-1-release-is-now-available/)? The ‘MediaType’ attribute is not declared. 0, 0: The ‘MediaType’ attribute is not declared. Any advice on how to correct this issue to get it to print successfully? The best thing to do is to create a label using our DLS software, and use that label in your code. You can easily change the contents of the label objects using our SDK and it is far easier than creating a label from scratch in code. I get the same, Label created via DLS and loaded into C#, MediaType not declared. it’s not usable for me nor is it in any kind visible, what’s going wrong. Could you share your code with me? I would like to see your label file and code. 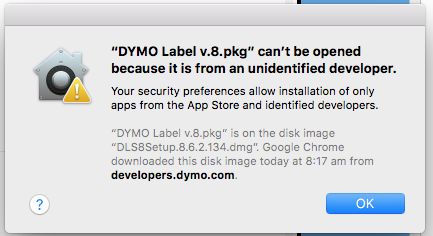 I’m trying to load a label i created in the Dymo Label v.8 software. Can you show me your label file and a snippet of code that you are using? Now that the new Dymo Wireless printer is out, do you anticipate there being a mobile SDK (JS or native) capable of printing directly to the wireless printer from a custom app or website? We’d love to stick with the Dymo brand rather than using a different brand for this context. We do have on our roadmap releasing an SDK that will work with mobile apps. Unfortunately, I cannot tell you when it will get done. Can the DYMO framework be used with Xamarin.Mac on MacOS, UWP on Windows or Xamari.forms on both. If not does UWP or Xamarin support is on road map. I know it will not work on Xamarin.Mac. You may be able to get UWP on Windows to work.